More than 150 important buildings in the Barcelona area opened their doors to the public. Allowing individuals the chance to meet over 200 different architects and artisans. The 48 hour Open House event, invites the public to visit infrastructures essential to our daily lives, hear and participate in activates design to understand materials, function, and divers uses of architecture. The sixth edition of this festival focuses on the discovery of both the metropolitan landscape and identity of the individual. The Barcelona Jazz Festival is an annual event where local and international jazz musicians arrive in the city and play to their hearts content. With several shows every week for a couple months, residents and visitors of Barcelona can choose what kind of jazz they want to hear and what venue they wish to experience the concert in with little hassle. This exhibition on the lifelong work of the artist Michael Snow. According to TimeOut Magazine “Michael Snow’s work seeks to explore the expressive capabilities of sound and image, challenging the duality of vision/representation.” With audience participation almost mandatory, Sequences will captivate the senses while teaching viewers about the process of creation and the limitless definitions of space, objects, pictures and sound. The Royal Academy of Arts in London has announced four proposals in their Urban Jigsaw competition. Four finalists have been selected for the next stage of the competition. Each proposals discusses ideas for renewal of the Brownfield sites in London. MVRCDV’s plan to create a form of urban life has gotten one step closer with the completion of the first building to their overall masterplan. The Flower Building is the landmark in MVRDV’ system to incorporate systems of pedestrian streets and plazas in an area most known for large boulevards and high-speed expressways, near the Shanghai’s Honqiao airport. The Hongqiao Central Business District is expected to achieve a three star ranking, the highest of the Chinese Green Building Label. The Design Museum in London is presenting an exhibition on bicycles and the newfound obsession the UK has with them. The exhibit showcases the process of designing and constructing bicycles and the unique culture of bike riders. Several different models will be shown including commuter bikes, mountain bikes and racing bikes. The Louisiana Museum of Modern Art in Denmark is also bringing attention to African architecture, with a dedicated Africa exhibition as the third chapter of its series Architecture, Culture and Identity. The exhibit presents various ways of living from across the African continent, focusing on the intersection of architecture, contemporary art and culture. After the bike tour around Amsterdam, students of the Barcelona Architecture Center sat and ate Lunch at The Eye (Film Museum) designed by the Vienna Office of Delugan Meissl Associated Architects. The Eye, features screening of classic films, documentaries, shorts, fiction, along with Dutch and Independent films. The bar in The Eye is worth visiting for its panoramic views of Amsterdam’s north bank waterfront. Students of the Barcelona Architecture Center had the opportunity to visit Gerrit Rietveld’s Schroder House while in Utrecht. The house was built before Rietveld joining the De Stijl movement, however some believe it was built during that period because it follows the style associated with the movement. The house was commissioned by Truus Schrider, a women with three children. Along with the tasks of design the house she wanted one preferably without wall, one that could create a connection between the inside and outside. He achieved this with the open concept on the second floor through a series of moveable walls that can allow an individual to change the space. While on tour of the Utrecht University, students explored the design of Utrecht’s University Library; designed by Wiel Arets. The exterior and interior of the library incorporate a series of a repeated fossilized papyrus printed on concrete panels along with being engraved in glass panels. The building houses over 4.2 million books in the library, a parking garage with 500 spaces, café, 1,300 student seats, 300 workstations, and an auditorium. During the tour of Utrecht University, students got a firsthand sense to the design and construction of OMA’s Educatorium. The design is conceived with the use of two sheets which fold and interlock. The concrete slab creates a space that allows room for each program to function as its purpose. Educatorium features two auditoriums, botanical gardens, cafeteria, and rooms for exams. The Educatorium promotes socialization, learning, and examination. Designed by the architecture firm Mecanoo and completed in 1997, the TU Delft Library has a modern design for an antique program. The library is naturally quiet through its “underground” appearance and materiality choices. Daylight permeates the interior through the iconic cone atrium that also serves as the building’s central staircase. With an open floor plan and a slanted green roof, the library provides comfortable spaces for students to study inside or outside. who are interested in studying Holland’s strategies for controlling water and also for those who are avid fans of industrial architecture. The BAC studio was fortunate enough to pay a visit to the TU Delft School of Architecture and have their own selfguided tour. The students got to see the model shops, the studio spaces, the school library and other spaces of the facility. It was an interesting comparison for students as they examined the work of the Dutch students and compared it to their American universities architecture programs. The Zaanse Schans is a region of Zaandam in North Holland that seems like a step back in time to the 18th century. Several antique windmills are in operation that can be toured and visitors can experience a form of industry prevalent to the 17th and 18th centuries. One of the windmills that is highly recommended is the saw mill where visitors can see how the windmill powers the saws that cut trees into lumber. The Fundacion Antoni Tapies offers a guided tour starting at their building, and looking at the history of two nearby buildings designed by Lluis Domenic i Montaner that maintain a close relationship: Palau Montaner, originally the printing press Montaner I Simon and now headquarters of the delegation of the government of Spain in Catalonia, and the Casa Thomas, comissioned by industrialist Josep Thomas, today Cubiñá, a furniture design store. Both of these buildings stand as significant heritage of Montaners original and iconic Modernist style, feasturing decoration with large paintings of glass mosaic, representing the invention of the printing press, in the case of Palau Montaner, and in the case of Casa Thomas, the lobby of the building is richly ornamented with plant motifs, and the stair railing is made out of wrought iron, typical of the time. This visit organized by the Fundacion Antoni Tapies is a unique oportunity to visit the interior of the buildings. Although this first weekend that it is offered we will be in The Netherlands, it is a good visit to keep in mind and plan for in November. Location: Espai Mercè Sala, Diagonal Metro Station Vestibule/Lobby (Lines L3 & L5). The exhibition opens the debate on contributions to public transportation towards the improvement of the environment. Specifically, Transportes Metropolitanos de Barcelona (TMB) exhibits how it has has contributed to reductions in the consumption of fuels, and in the number of waste and pollution emissions. from Barcelona consumos of emisiones of Waste and pollutants. The Exhibition “TMB in action, A sustainable Journey” addresses the major challenges of cities when addressing sustainability. Dates: From Sept. 09, 2015, until Jan. 09, 2016. As we all know from our art and architectural history education, Andrea Palladio has been a hugely influential figure in the field of architecture, construction and design for centuries after his death. This exhibition presented by the RIBA ‘ introduces Andrea Palladio’s design principles and explores how they have been interpreted, copied and re-imagined across time and continents throughout the years. Designed by Caruso St John, this exhibition explores the relationship between modern styles that employ Palladian ideas and adapt them to current uses. It features works by Palladio never previously exhibited and other original drawings from the RIBA Collections by some of the UK’s most celebrated architects, including Colen Campbell, William Kent and Edwin Lutyens. When in the Netherlands: Check out the Dutch Design Week! Location: Eindhoven, Netherlands. 100 different locations of events and places to visit. Admission cost: Most locations are free, unless stated otherwise in the program on the website. Is it a fortunate coincidence that our trip to the Netherlands coincided with Dutch Design Week? Probably not! We probably owe it to the careful planning of events of Zana Bosnick and Ivan Blasi, and the BAC in general. Regardless of how this came to be, it would be worth it to venture out to Eindhoven on one of our free afternoons (or on our free day on Friday) during the trip and check out this event, filled with many exhibitions, workshops, seminars and parties at many venues. The event could not be explained any better than it is on their website: “For 9 whole days, DDW boasts 100 locations, presenting the processes, experiments and ideas, answers and solutions thought up by 2400 designers. Come and be amazed, surprised or astonished. Ask yourself new questions, draw inspiration for your own answers and allow the power of design to convince you”. This week, Prof. Pia Wortham gave a very interesting and highly descriptive lecture on building with Masonry, covering not only a number of Spanish architects who mastered the construction techniques with these materials through their projects, but also other architects known to work with the material, such as Louis Kahn. The lecture took special interest in long-spanning roof structures which served large-hall type spaces, such as churches, warehouses and factories. These large building typologies needed tall and wide-spanning roofs, that would also allow plenty of natural light to come in. We looked at numerous examples that employed the Catalan vault or guastavino vault building techniques, such as the Vapor building by Aymerich, Amar I Joven, Casaramona by Puig I Cadafalch, and projects by renowned architects Eladio Dieste and Felix Candela. What I found most interesting about many of these projects, is that they demanded relatively low budgets, and also worked with very basic technologies. In many of these countries, the manual labor was quite simple. Thus, the value of this type of architecture using brick not only comes from the beautiful geometries and play of light and shadow involved, but also in the audacity of the architects to develop clear construction methodologies that would allow non-sophisticated workers to lay out and efficiently execute complex geometries with brick or tile units. This week’s History of Urbanism Seminar centered around important movements in 20th Century Barcelona to expand and modernize the city. Among others, the Linking Plan proposed by Leon Jaussely, the isolated case of Gaudi’s Park Guell, inspired in the Garden City Movement which arrived to Barcelona around 1915, and finally, the GATPAC + LeCorbusier’s Marcia Plan. All these urban investigations and proposals were really interesting and helped further understand the multi-layered system’s which compose the city of Barcelona. During this Seminar we also looked at Post-Civil-War architecture. During the discussion of this topic, the Placa Sant Felip Neri came up, as it was heavily bombarded during the war. When speaking of the Church found by that square, Prof. Duran narrated the anecdote of Gaudi’s death. She explained that this church was where Gaudi would come as a child to pray, every day. In my opinion, this was the most interesting and curious anecodte of the class, and dispelled any rumors that the class had heard beforehand. For example, it is said that Gaudi was run over by the Tram on Avinguda Diagonal, as he was stepping back from Sagrada Familia to contemplate it as his masterpiece. Prof. Duran explained that, indeed, Gaudi died as a result of an accident with the Tram, but this happened on Gran Vía de las Cortes Calatanes intersection with Carrer Bailén. Coincidentally, Gaudi was making his way from Sagrada Familia, to the Sant Felip Neri church when this happened. Prof. Duran explained that Gaudi had such a beat-down appearance (long beard, dressed with clothes stained from construction works, etc) that he was taken for a homeless. He was transported to Hospital de la Santa Cruz, which was known as a place for homeless people to be taken care of. She explained lastly that Gaudi’s construction crew quickly realized his absence, and set out to look for him in the city for several days. When they finally found him, they asked him if he wanted to get transported to another Hospital, and he answered that if this is how the poor were treated in the verge of their death, he would rather die as a poor man. He passed away the next day, at 73 years old, leaving behind invaluable works of architecture for the whole world to admire, and the single reason because of which many people visit Barcelona today: the Sagrada Familia. The challenges of a study abroad architecture student: finding a balance between the studio life and the city life. BAC Students have been hard at work this week, aiming towards developing their project to a good level of completion, and presenting their design ideas on Thursday, October 15, for the second “Formal Review” of the semester. Wednesday in-between seminar classes was no exception to be taking breaks from thinking about the projects or working on them. Several students met with Professor Pia Wortham to receive some feedback on structural design applied to different projects developed for La Escocesa Complex. Prof. Wortham made herself widely available and took great care and attention when looking at the projects, trying to show the students that there could be many possible solutions to the design problems, repeating that it depended on how they were looked at. Structure or not, students kept working late into the night, forming an architectural overnight camp at the BAC, with many receiving the morning of Thursday still sitting at their desks at BAC. Studying abroad in Barcelona implies an intense lifestyle, it may seem, and many students have found that it is challenging to find a balance between in-class and out-of-class learning. We are in a city filled with many exciting things to do and see, and must find a way to learn from it and take advantage of it on two different levels: the academic, and the extra-curricular. Both provide a great amount of learning and growing, important for our formation as future professional architects and as citizens of the globalized world we live in. Midterm Presentations at BAC: The Good, The Bad and The Sleepy. Thursday morning hit some by surprise in coming so quickly, others anticipated it farther ahead, the fact is that Midterm Studio Reviews had everybody a bit on edge, especially because of all of the other things to follow suit closely (e.g. the Amsterdam Trip, now only a few hours away). The environment for crit-day actually turned out to be a lot less uptight and formal. The student’s laid out there presentation boards on their desks, and circulated around the room, looking at the work put out by their classmates. Friendly and curious conversations took place: “How did you deal with this issue on your design?”, “Wow, that’s a really cool section-perspective, what software did you use to model that”, were some of the things heard. To start of the morning, Professor Roldan’s studio sat down and talked about how the student’s perceived what has gone by of the semester so far, and talking about the studio and design culture of the course in general. Prof. Roldan asked some intriguing and thought-provoking questions as always, and asked the students to explain their thoughts and opinions on the quality of the work presented in the sheets. After this, the studio group proceeded to hear presentations from 4 different students. Halfway through the morning, Professor Miralles, an invited critic for the day who currently teaches architecture at UPC Valles and ETSAB (and will also be teaching at BAC next semester), jumped in to participate in the critiques, and gave a few students very interesting and thoughtful feedback. The feedback was welcomed and helpful, but at the end of the day, we knew it was time to rest and start preparing for the Netherlands trip. Mid-term Design Studio Review took place on October 16th. Students presented and discussed their projects to receive feedback from both BAC professors and their classmates. We had Professor Roger Miralles as special guest, who did critical remarks on the student projects. We have successfully reached the middle of the Fall 2015 course and are excited to see the final production on each of these projects! This past Tuesday October 13th, our Fall 2015 students had the opportunity to visit the newest offices of b720 Fermín Váquez architects as part of the Seminar Lecture Series visits lead by Mercé Berengué. Fermín Váquez , principal architect, presented two projects that represent the office’s analysis and design process but also translate into the main characteristics that define the architect’s role through the different stages of a project. Client’s relationships, programmatic needs, first design concepts and ideas, budgeting decisions, structural design and construction process, where some of the stages described for both the Les Encants Market project in Barcelona, and the Spanish National Pavilion in the current Expo Milan 2015. 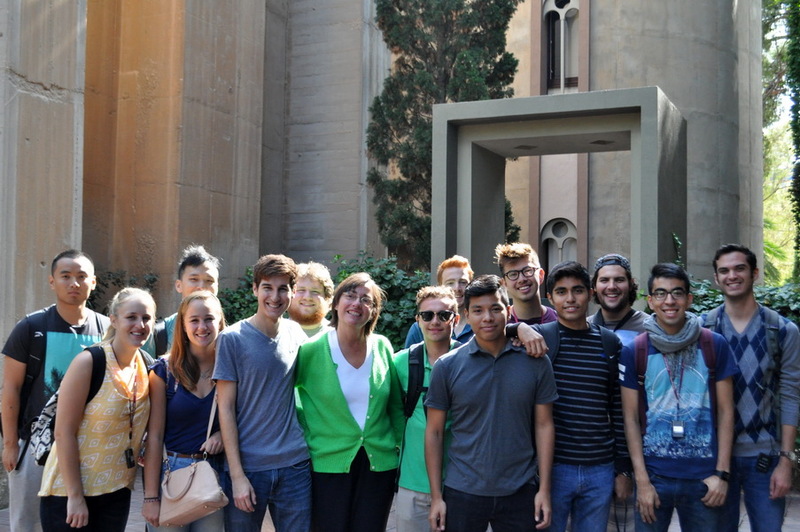 Friday October 9th, our Fall 2015 students experienced a short visit to Ricardo Bofill Taller de Arquitectura office lead by RBTA staff and Mercé Berengué. The offices are located on a former concrete factory at the outskirts of Barcelona. 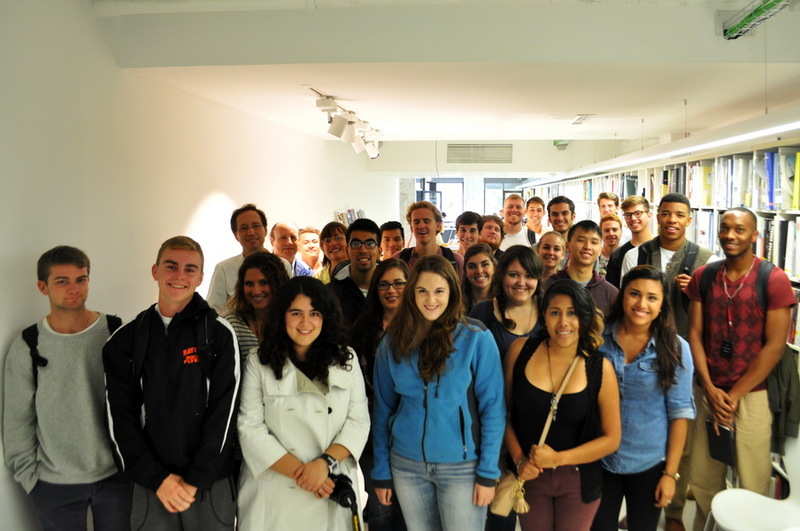 Students visited some of the studio’s offices as well as their main meeting room and common areas. The visit provided a brief insight into this Barcelona based architecture firm that has made its name with a significant catalog of projects through its years of experience. 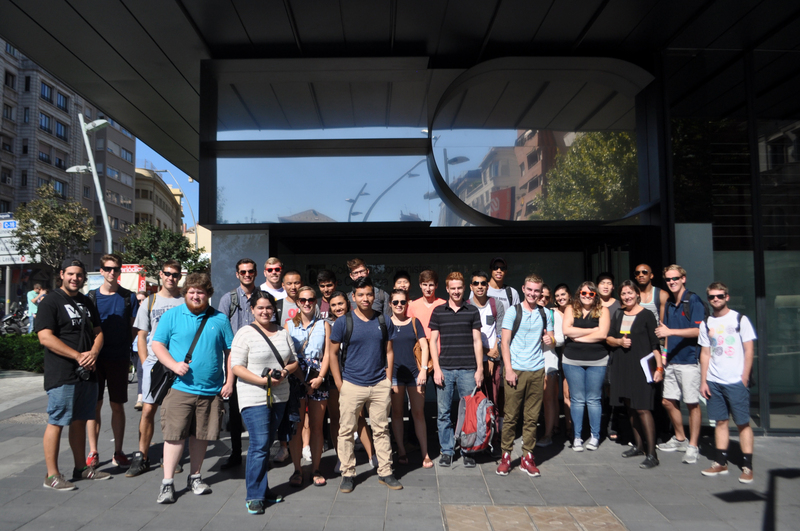 On Tuesday October 6th and as part of the Seminar Lecture Series Visits, students visited the Economists Headquarters in Barcelona, project by Roldán + Berengué architects. The visit was lead by principal architect and BAC faculty Mercè Berengué. Students experienced the spatial qualities and understood the structural system and logic used in this project that references the city scale. Agata Buscemi focuses her work primarily on landscape and public space design, expanding to masterplaning and architecture projects. This lecture covered the historical transformation of Barcelona’s landscape, including some key projects and urban plans and how each one of them has contributed in creating the urban city landscape perceived in Barcelona nowadays. Aiming to broaden student’s panorama in relation to their current Studio project, following her lecture students had a chance to discuss their projects individually and receive her feedback sustained with her academic and professional experience.